The overblown “Avengers: Infinity War” has such high ambitions that its reach far exceeds its grasp. If anything, this 156 minute epic should be seen as a celebration of what the Marvel Cinematic Universe has accomplished since its launch in 2008 rather than any kind of coherent cinematic experience. During that 11 year period, Disney and Marvel managed to produce 19 films and consequentially ended up dominating the cinematic zeitgeist by make a mockery of any studio that even threatened to take its crown (cue in Warner Brothers and their failed DCEU). And so, "Infinity War" comes to us with 30 lead roles. 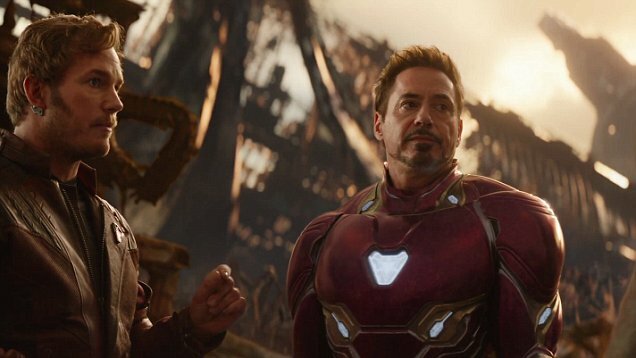 No wonder this daunting and almost impossible task has been given to Joe and Anthony Russo whom, after having directed two of the very best Marvel movies of the MCU, "Civil War" and "The Winter Soldier," attempt to cram in as much as they can into this ambitious film. Another near-impossible task must have been writing the screenplay, which credited here to Christopher Markus and Stephen McFeely and, despite some inspiring stretches, meanders a little too much in its back-and-fortness. The lack of settling down in their script dulls the senses and makes you wonder if a three-parter would have been better than this restrictive two-parter. The plot itself is rather simple, Thanos, an intergalactic evil-doer that stands at 12 feet tall, with a purple face and muscle mass that far surpasses even the Hulk’s, wants to destroy the world. Yeah, I know, not this again. Except Thanos, the highlight of this messy, convoluted film, is voiced by Josh Brolin in a motion-capture performance that makes him the most fully-fleshed character of the movie. No wonder, despite his call for chaos (“You have become the children of Thanos”), the vulnerability and sympathetic nature that Thanos shows seep through the film. Thanos’ goal is to collect the six Infinity Stones, which if all worn on his fingers will grant him supreme power in the galaxy. 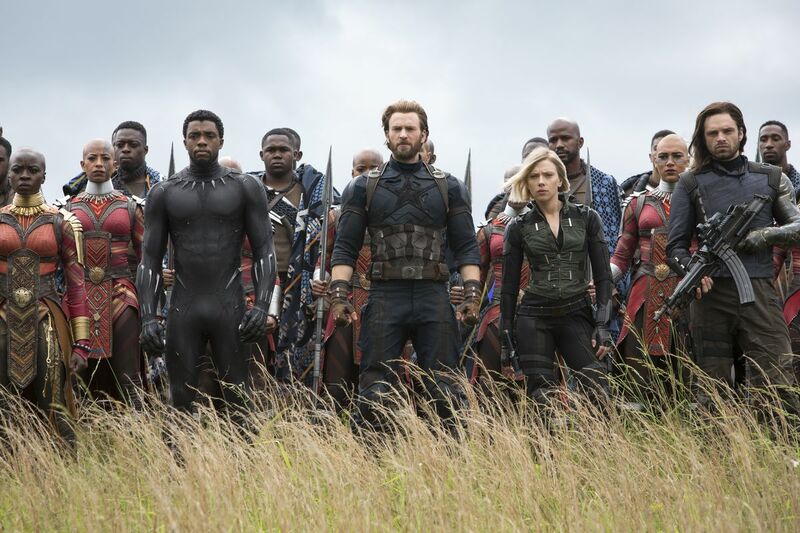 It’s in the way the Russos have to split their heroes into more than a half a dozen storylines that gives the film an exhaustive feel. Are you ready? Tony Stark/Iron Man, as played by Robert Downey Jr. meets up with Doctor Strange (Benedict Cumberbatch) and his protege Peter Parker/Spider-Man (Tom Holland). Thor (Chris Hemsworth) joins the Guardians of the Galaxy, led by Peter Quill/Star Lord (Chris Pratt), Gamora (Zoe Saldana), Groot (Vin Diesel) and, as usual, a scene-stealing Dave Bautista as the dim-wittedbut good-hearted Drax. 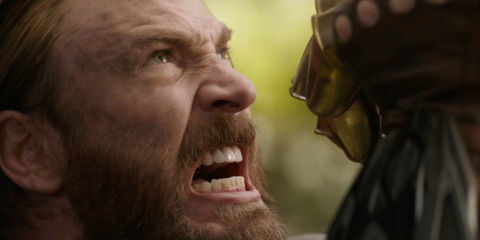 On the other side of the continent, we have a bearded, but well-groomed Steve Rogers/Captain America (Chris Evans) doing battle alongside King T’Challa/Black Panther (Chadwick Boseman) and Okeye (Danai Gurira), with Vision (Paul Bettany) and Wanda Maximoff/Scarlet Witch (Elizabeth Olsen) added in for impressionable measure. Also, Bruce Banner (Mark Ruffalo), jumping through storylines, relentlessly tries to turn into the Hulk but just can’t muster up the anger needed to transform into the green giant. Side characters that barely have any screentime include War Machine (Don Cheadle ), Falcon (Anthony Mackie), and, most irksome of all, Black Widow (Scarlett Johansson). Completely absent for the rendezvous are Ant-Man (Paul Rudd), and Hawkeye (Jeremy Renner). People already knew, this being the end of an era for the MCU, that heads would surely roll and characters we’ve come to love would be killed off. If you’re looking to be shocked by the death of a mainstay name then think again. Yes, a few side characters do bite the dust in “Infinity War” (I counted four) but even those deaths feel forced and rather uneventful. You’ll have to wait until next year’s second chapter to know if Cap, Iron Man, Thor and Hulk survive the wrath of Thanos. Marvel wants maximal box-office performance and killing off characters that can sell toys and lunchboxes would be a terrible marketing decision. Suffice to say, I’m afraid, the In Memoriams will have to wait.